The fall decor is up and we are ready for fall. Ainsley keeps asking everyday now that it's up if it's Halloween yet, and gets pretty mad when the answer is "No, not today." The crows from the Dollar Store are up again this year. I just really love those guys. 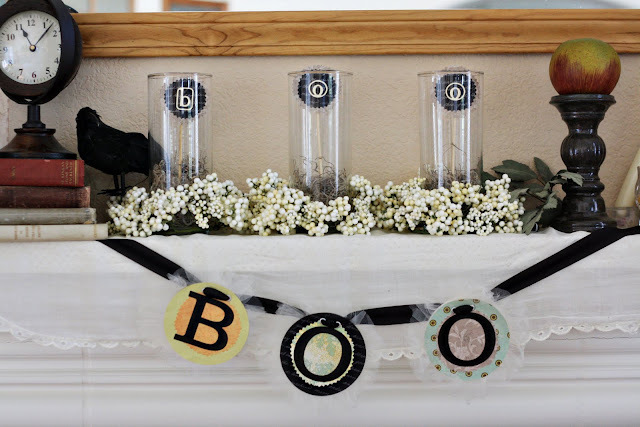 I'm not into decor that is too cutesy or overly "halloween." Though I guess the BOO sign counts - but I draw the line there. My paper wreath with the flowers and birds on it got flipped around so it's just a plain wreath now. I'll flip it back when it's spring again. This is the current decor on my table. I should also point out that I don't like to decorate with the color orange very much. 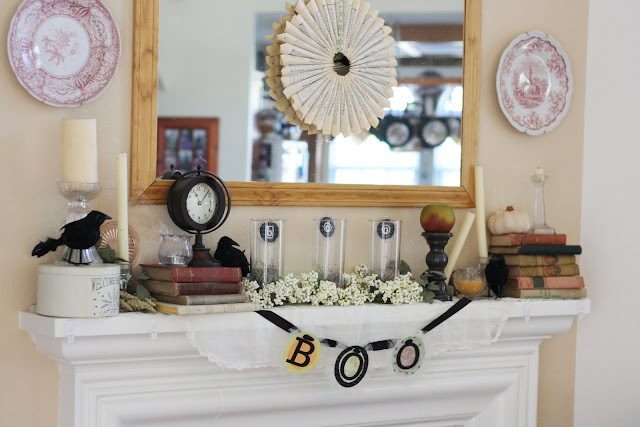 I prefer to decorate with white, black, and shades in neutral tones for fall. I just think the orange is too bright and would clash badly with my living room which has a lot of pinks, reds, and greens. 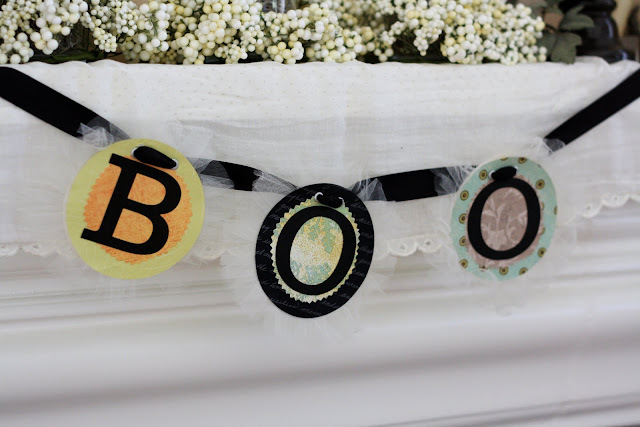 I'm considering changing the "B" on my BOO sign but maybe that's just a little too over-the-top. 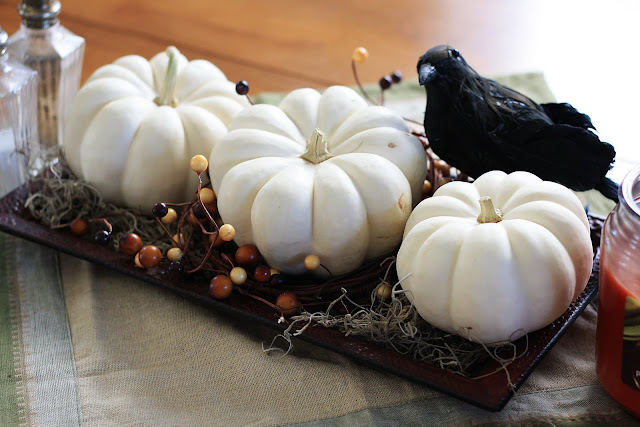 I had a few leftover mini pumpkins in orange and a couple crows and I gave them to the kids to "decorate" their own room. They were thrilled and showed me all the spots that they put them. It was so funny seeing pumpkins and crows sticking out of the toy buckets and doll houses. They were so very happy getting their own items for their rooms though they have no idea how to artistically arrange anything. I do the same thing at Christmas with all the cast-off Christmas decor. Hmmm, look at our front door. Can you tell a homeschooler lives here? He's very proud of his skeleton on the front door I'll have you know, and that was also his science lesson for the week - bones, that is. Here are the three kiddos sitting with Tessa who is thrilled to be with them can't you tell? They are leaning up against a couple of quilts. The top one is the lap sized one I made quickly for Tessa to roll around on when she is on the floor with her toys. It's in pinks, browns and lime green. Bright! Hunter got a mustache and war paint drawn on his face during the homeschool park day. He also is sporting a Star Wars tattoo on his arm. Hunter fell asleep sobbing last night because the fake tattoo he is wearing is his favorite Star Wars character and he was already crying about when it will come off (it was still fresh). He loves it THAT much and was crying in anticipation of the tragic event. The woes of a five year old. Tonight was the Saturday night bath routine before church tomorrow. This brought on a fresh onslaught of tears and he tried to figure out how to keep it totally dry so it wouldn't wash off. We had one clean boy minus one dirty arm which he was bound and determined to keep dry and dirty. Anything to keep that tattoo on as long as possible. Finally I took over and washed every square inch around the tattoo while being carefully supervised by Hunter to make sure that I didn't get a drop on it. Heck, at this rate, that baby oughta last for days! Speaking of Halloween and Star Wars, the boy wants to be Chewbacca this year. Oh help! He wanted to be a "big fat hippo" last year and I thought that was a stretch for me (though I managed to pull it off). I found a cheap $12 mask, but with fur at $13 a yard, I don't know if I can swing it cheaply....I'm still on the hunt and my creative wheels are turning. Why does he do this to me every stinkin' year????? Your home looks so beautiful! There's an award for you on my blog, Jenny! (no pressure to follow through on the "award rules," I just wanted to let you know that I appreciate all that you do! beautiful decorations! i'm excited to see what you come up with for thanksgiving...i need a little inspiration. thanks for visiting my blog...it's always delightful to meet new bloggers!